Within less than 24 hours of her well-orchestrated announcement that she was running for president, California Senator Kamala Harris officially became the 2020 election’s version of Hillary Clinton and offered more proof that the Democratic Party is deeply divided going into the 2020 election. There is a simple solution, but first it is useful to dissect Harris’ campaign recent hiccup regrading Medicare-for-all for what it tells us about how deeply divided the Democratic Party remains. The day after her launch announcement, CNN generously televised Harris’ hour-long town hall in Des Moines, Iowa, and it didn’t take long for an audience member to ask Harris about Medicare-for-all, a health care reform bill she has already co-sponsored in the U.S. Senate, along with Bernie Sanders, Elizabeth Warren and Kirsten Gillibrand. Tapper: … initially co-sponsored by Sen. Bernie Sanders. You’re also a co-sponsor onto it. I believe it will totally eliminate private insurance. So for people out there who like their insurance, they don’t get to keep it? But it didn’t take long for Harris to betray her own words. Within hours of her town hall comments on private insurance, some centrist Democrats squawked. “You can’t just pull the rug out from underneath everybody’s feet,” said Michigan Democrat Sen. Gary Peters. Possible independent candidate for president, Starbucks CEO Howard Schultz, said Harris’ health care stance is exactly why a candidacy like his is needed. 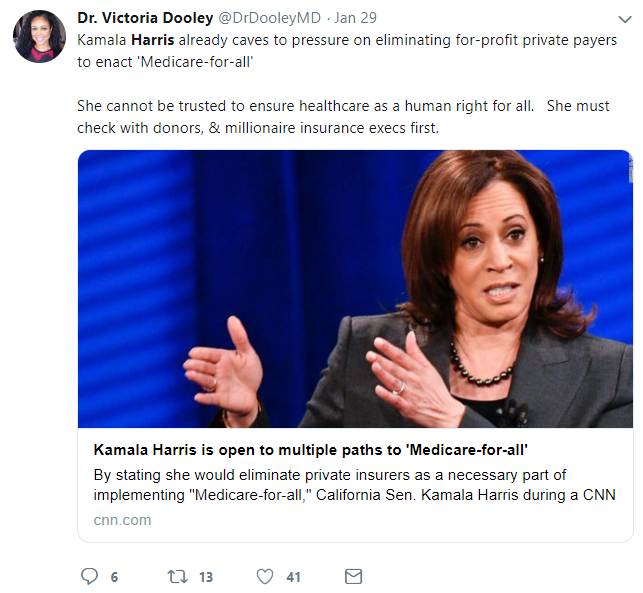 Harris’ campaign went into damage control as one of her advisers suggested the candidate was also considering health reform plans which would preserve the private insurance industry. As Kaczynski went back and polished his Harris campaign public relations release, Harris national press secretary Ian Sams told other reporters at CNN that her consideration of alternate paths to a single payer system did not indicate a lack of commitment to the single payer goal. Will health care utilization rates increase dramatically under Medicare-for-all as the previously uninsured gain access? If so, what will that do to the program’s costs? Will employers lift salaries and wages once their contribution to employees’ health insurance coverage goes away? Can we expect doctors and hospitals to take substantial pay cuts and not change the quality or availability of health care? How do you shut down the private insurance industry? And when you deliberately shrink the economy in such a way, what are the short- and long-term effects on employment and output? Bernie Sanders, Alexandria Ocasio-Cortez and the progressives have yet to adequately answer those questions. And they will have to be answered before Medicare-for-all becomes a reality. And I still believe it will. The economic case for Medicare-for-all is just too strong. But for Harris to go wobbly right out of the gate on the elimination of private insurance, the central cost-saving element of the Medicare-for-all reform, is a non-starter with many in the progressive wing of Democratic Party. Progressives were already suspicious of Harris, given her tenures as a San Francisco district attorney and the Attorney General of California, as well as her unapologetic advocacy for tougher enforcement and sentencing laws. Still, some progressives held out hope that she would at least stand by her public support for Sanders’ health care reform bill. Unfortunately, at a minimum, her equivocation on the private insurance question demonstrates her unsteadiness in defending the Sanders Medicare-for-all plan. To uncompromising progressives, Harris’ performance reveals her disingenuous support for Medicare-for-all in the first place. In fairness to Harris, there are single payer proposals that aim to preserve a role for private insurers. Furthermore, critics of Medicare-for-all willfully misrepresent what the Sanders bill would actually do with respect to private insurance. While Section 107 of Sanders’ bill expressly states — “It shall be unlawful for a private health insurer to sell health insurance coverage that duplicates the benefits provided under this Act” — private insurance companies would still be allowed to offer supplemental coverage, as occurs under Medicare now. If it were just Harris, a progressive could hope she’s an aberration. After all, 81 percent of Democrats support the “idea” of Medicare-for-all, according to a January 2019 survey by the Kaiser Family Foundation. A Democrat aspiring to win the party’s nomination for president would be crazy to oppose Medicare-for-all, right? If other Democratic candidates’ reactions to Harris’ predicament are an indication, however, Medicare-for-all may not be on sound footing with the party’s other leading presidential hopefuls. …And the third, how do we get universal coverage. Medicare for all. Lots of paths for how to do that. But we know where we are aiming. And that is, every American has health care at a price they can afford. And that the overall costs in the system are held as low as possible. That was the abridged version of Warren’s answer. New York Senator Kirsten Gillibrand was perhaps clearer, but hardly unequivocal in support of Medicare-for-all’s elimination of private insurers. Germany is an example of such a country. While 86 percent of Germany’s population receive health coverage through a public option, 14 percent use private health insurance. Booker, with his deep ties to the pharmaceutical industry, and Gillibrand, with her deep bench of Wall Street donors, have never been favorites among progressives, but Warren is different. She is expected to the primary competitor with Sanders for the Democrats’ progressive voters— who may account for half of likely Democratic voters today. The winner in that battle will probably be among the final two candidates vying for the party’s nomination. Warren’s answer to the private insurer question will generate more than a little disappointment among progressives. Incrementalism, no matter how earnest, will not cut it with progressives. Listen to Sanders and Ocasio-Cortez. They talk about a “complete transformation” and “re-engineering” of not just the American health care system but the entire economy. Progressives are trying to change the system, not tweek it. What can bridge Democratic progressives and centrists? If you dangled centrist Democrats from New York’s George Washington Bridge and forced them to choose between the economic policies of Alexandria Ocasio-Cortez and those of Donald Trump, they would choose Trump’s without pause. Trump’s economic policies better serve their interests and the interests of their donors. It is not complicated. It is politicized self-interest. That is how pluralist democracies work. With that in mind, the Democratic establishment cannot assume their two ideological flanks will stay loyal in a Harris-Trump or Sanders-Trump race. They are both heading down a path that could easily get Trump re-elected. Something has to change the current dynamic within the party. The formation of governments in other countries frequently depend on political coalitions to achieve a governing majority. It is an essential element in the art of governing. Benjamin Netanyahu’s Likud party in Israel needed the support of the Kulanu, Shas and The Jewish Home parties to form their current government. Giuseppe Conte’s government in Italy needed a six-party agreement — Five Star Movement, League, Forza Italia, Democratic Party, Brothers of Italy, and Free & Equal — to form a governing coalition in 2018. In every case, the smaller parties in the coalition gained something concrete by joining the government — typically a cabinet position, but sometimes a binding agreement on a favored policy initiative (as was the case for the Kulanu and The Jewish Home parties in Israel). That is how governing is accomplished in divided, polarized political environments. Granted, the U.S. does not have a parliamentary system, but we do we have the deep political divisions. Our two-party system merely papers over and suppresses many of these differences. They still exist. That is why the Democratic Party’s two factions must agree now, whichever faction wins the nomination (and it still looks like this is Harris’ nomination to lose), the other faction deserves — or, rather, should demand — the vice presidential slot. Had Hillary Clinton made this deal with Sanders in 2016, she’d be gearing up for her re-election campaign right now. As it stands, for those who believe issues like climate change and income inequality represent immediate and existential threats to this country, the Democrats cannot afford to lose the presidency in 2020. And to avoid that outcome, the Democrats need to see themselves as they are — an estranged, unstable coalition of two distinct and often opposed political doctrines. To fail to embrace that reality is to risk re-electing Donald Trump.